I come across lots of stories about cat, kitten rescues and I always find it disturbing that people can abandon, turn out a cat in the cold or worse. It angers me to read these things and it should anger anyone really but It should also inspire us to act, to be aware and to encourage acts of compassion. What I love reading are the positive stories that come out of these events and this particular Kitten Rescue just really stuck with me. When you see these little babies you will understand. 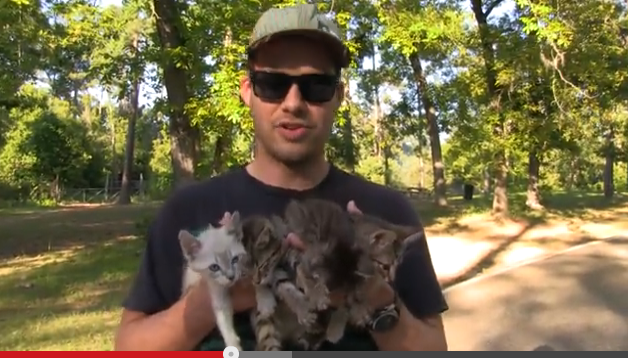 While a couple were walking through the woods, they came across 4 tiny little kittens, running up to them. They knew right away that they couldn’t leave them there. This entry was posted in Cat Rescue and tagged acts of kindness, cat videos, Texas by Purr and Roar. Bookmark the permalink. A friend found my kitten on the side of the road, terrified by the traffic. She took him home but was unable to care for him so gave him to me! I’m so glad he came into my life.